Hey there! Thanks for visiting! 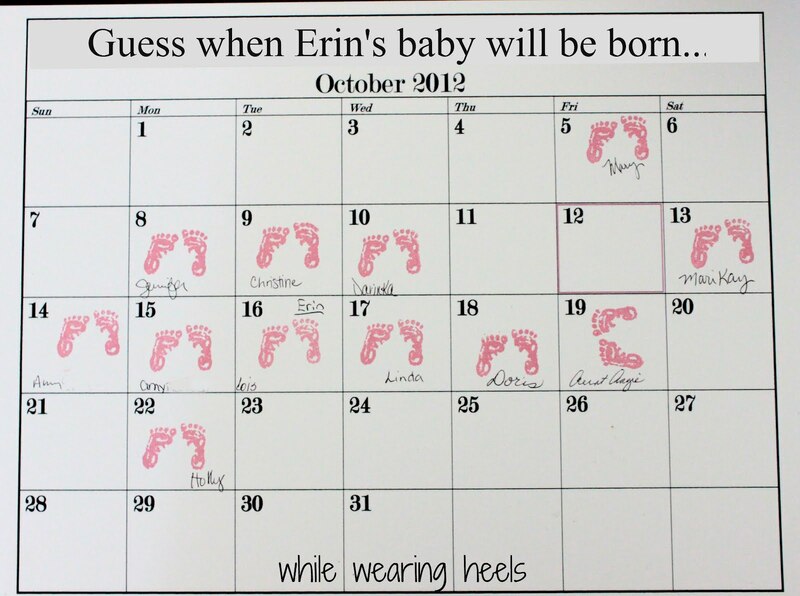 Let’s talk about baby showers. They seem to be a love it or hate it kind of thing. What about you, do you love them or not? I’m in the NOT category for the most part. I find them awkward. Can you relate? Are you planning a baby shower and want something more than “name the candy bar in the diaper” game. Or how about the game where you guess how many inches it takes to get around mommy’s tummy? Eek. Not my idea of a good time. If you are looking for baby shower ideas that will be fun, memorable, and aren’t the same shower games you’ve played at every baby shower you’ve ever been to, keep reading. These are ideas that everyone one will love, even the mom who doesn’t love being the center of attention. 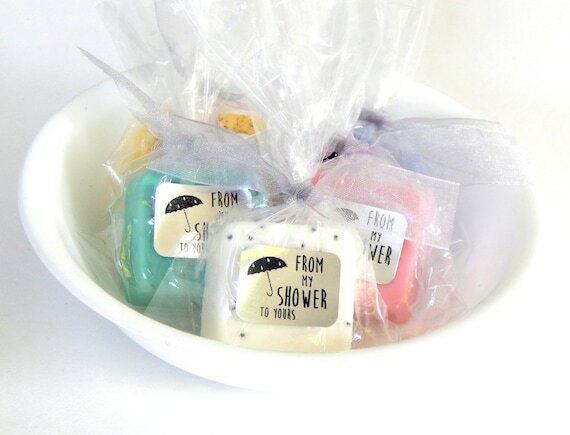 Can your guests get through the whole shower without saying “baby”? There’s a fun game to find out if they are up to the task. Do your party-goers know how much babies cost? Find out with a Price is Right game – Baby Edition. I’m small, so by the time I hit 6 months people are asking me if I’m “due any day now”… It’s uncomfortable and doesn’t really make me feel that great. Don’t put Mom on the spot! Celebrate with her, not her belly. Yes, celebrate the baby that will soon be welcomed to Earth, but celebrate mom too! With these games, everyone will have a good time! Baby Animal Names Game. 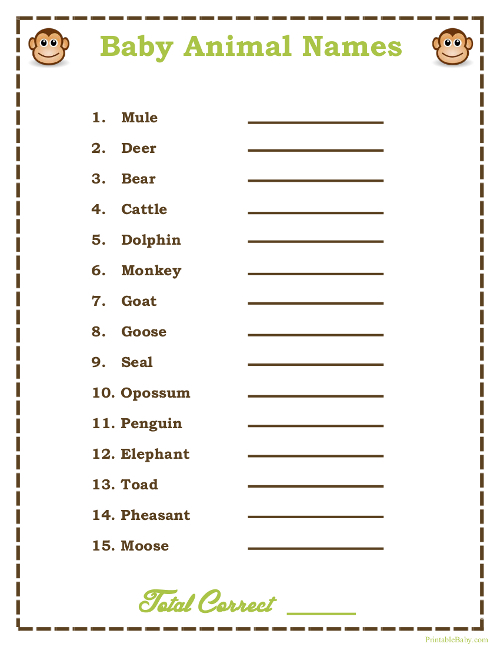 Test your party-goers zoology knowledge by asking players to name the baby versions of each animal. 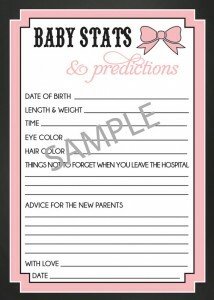 Grab the printable from Printable Baby. Don’t say “Baby”. The player with the most clothes pins is the big momma on campus! How long can your guests last at a party celebrating a baby without talking about it?! Find the details on The D Spot. Do your guests know how much it costs to have a baby? Find out with The Price is Right – Baby Shower Edition! Find it on Fugal Fanatic. Candy Match Up. Can you match these candies with the baby related words? Is 100 Grand the hospital bill or the college fund? 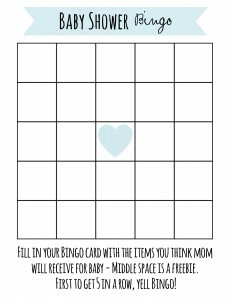 Find this instant download printable game on Etsy. This is a fun game if you’re going to have mom open her gifts during the party. Add a little more thrill to watching someone else get all the gifts. Get the printable at Frugal Fanatic. I think this is such a fun momento for mom! How fun would it be to see which of your friends is the closest? You can decide how much info to give your guests. Keep it vague with nothing but the due date or divulge some clues. Did any siblings come early? Are there any stats you want to share? Baby’s last estimated weight, for example… Don’t forget to have Mom make a prediction too! 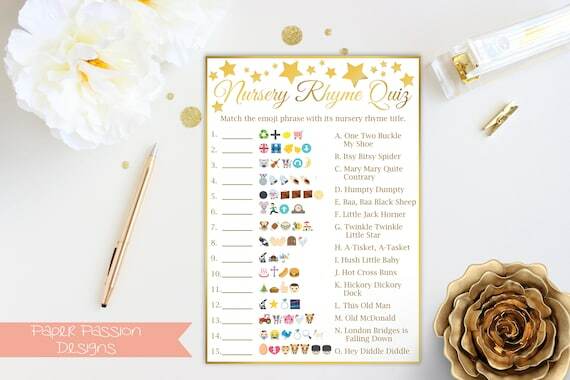 Nursery Rhyme Quiz time. Who knows their nursery rhymes and lullabies? I love that this one is all about what you know, not how lucky you are. I have terrible luck. 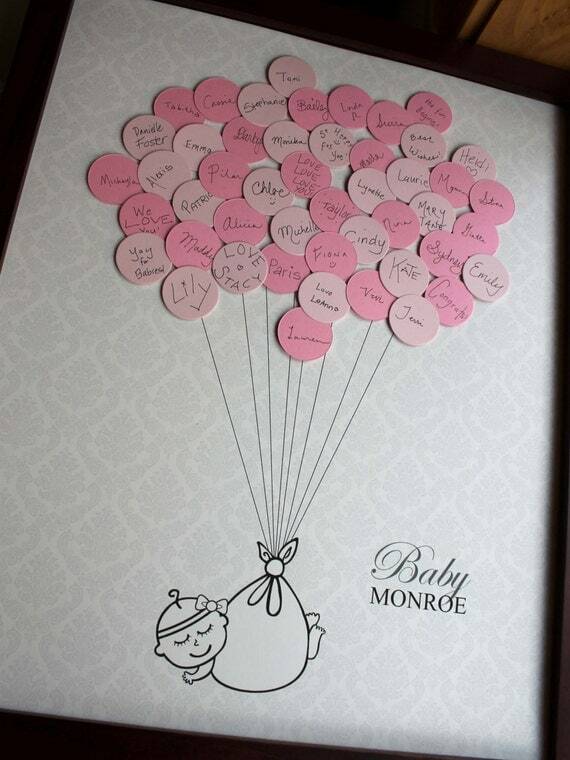 Every momma would love to get a whole list of well wishes for her sweet little babe. A variation that might be fun would be for each mom to share her best piece of mom advice with the mom-to-be. We did something similar when I got married and it’s super fun to look back and see what people thought was the most important thing to share. This is similar to the prediction calendar and my add-on idea above, and SOO much more in depth. These would be a fun addition to the baby book. How many times have you looked at the guest book from your wedding? Or your graduation party? Or any other time you’ve had a guest book? These guest books aren’t even books and they are perfect to hang in baby’s room. 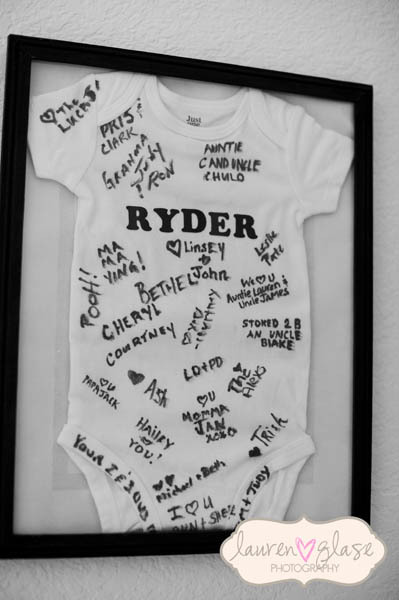 That onesie is absolutely awesome! Are games worth playing if there isn’t a cool prize? Of course, but cool prizes make it even better, right? This is a prize that anyone would want right?! I also saw a prize pack that included travel sized shower gels, bubble bath and a loofah, but couldn’t find the original photo source so it’s not included. Definitely a cute idea though. This isn’t a new idea, it’s been around for years and popular especially in the last few; however, I really liked the wording of this request. Of all the ones I read, this is probably the one I’d actually get a book for. 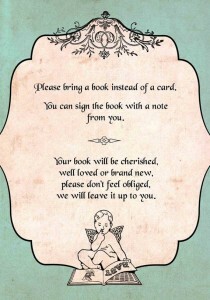 Although, I also liked the wording of this request via Cupid Designs on Etsy, stating the book didn’t have to be new. No reason Dad shouldn’t get to party too. it will be a co-ed BaBy-Que. Daddy helped bring about this miracle too! 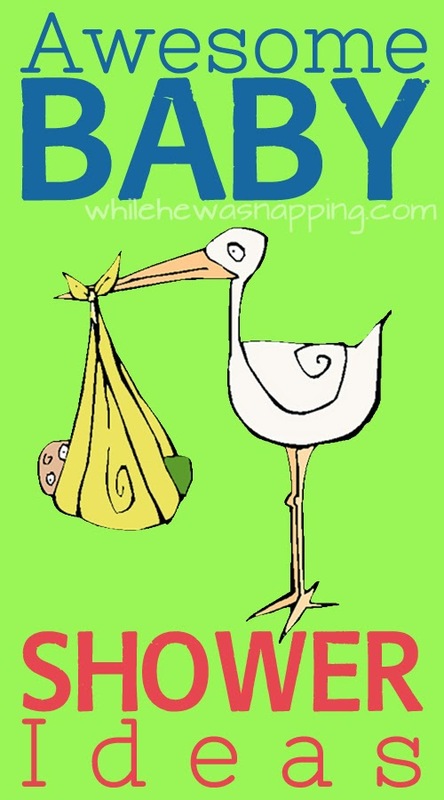 Do you have any great baby shower games you love to play? Did someone give you a super awesome guest book? Share it below in the comments! Great ideas! 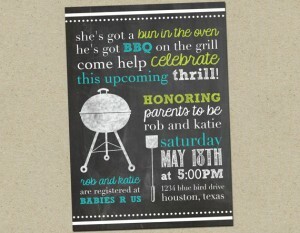 This ideas really helps me a lot for the baby shower that I am throwing for my sister. This was a good collection of ideas. Thanks for assembling for us. I’ve pinned this to my shower ideas board. Hey! Great post. I didn’t have baby showers for either of my little ones, but I’m pretty introverted too, so I didn’t mind not being the center of attention. I started making onesie making kits that I sell in my Etsy shop that I would have loved to do had I had a baby shower. Just another idea to share for people who might want something crafty to do. They’re not as messy as the markers- they are iron on appliques that don’t require sewing and they’re super cute. Hope you might check them out! http://www.bingecrafter.etsy.com. Those are adorable! 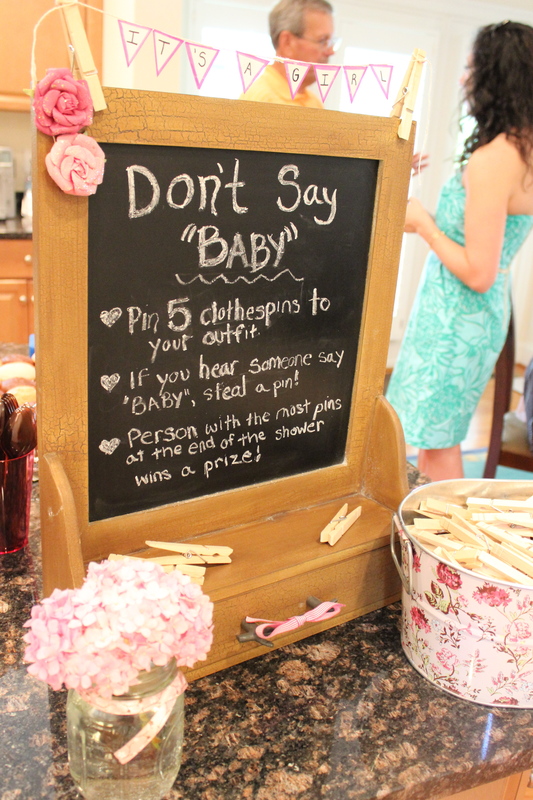 And I love that Mom (or the hostess) gets a little more control over what goes on the onesies! I’ve seen some that are just saturated in glittery fabric paint that no mother really wants to try to wash and looks so uncomfortable for baby. Those are a great idea. I will have to remember your shop for any future baby showers I may end up throwing. Thanks for commenting!